Sky Products can assist with snow guard design whether the project is in design or retrofit stages. 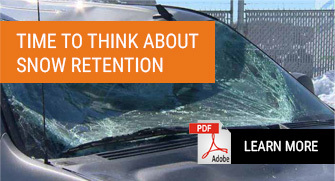 Provides engineered detail drawings, load calculations, and location of snow guards. In house product education including sales and technical support, budget development, and substation requests. Product recommendation based on roof panel manufacturer, model, project location and roof dimensions. We have worked with Sky Products for many years. Their technical knowledge and support in determining the right S-5! products, pricing, delivery times and overall service are excellent! The service we get from Sky Products is outstanding. Dave and his team are always available to help answer questions, or provide other support as may be required. The combination of outstanding products from S-5! and unparalleled customer service from Sky Products is unbeatable. Pricing is updated regularly, products are available, and technical support is always available when needed. There is no reason to go anywhere else! 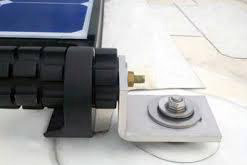 Sky Products provides standard or customized solutions to attach solar panels, rooftop lighting, signs, HVAC units, walkways, or snow retention to standing seam roofs without penetrating the panels. Based on our many years of experience and expertise, we help our customers with standard or customized solutions. A snow guard system mitigates the risk of sudden and unexpected release of snow from the roof, which can lead to damaged roof panels, gutters, light fixtures, walls and foundations, protection of lower roofs or worse, severe injury to people. The idea is to evacuate the snow in a predictable and controlled fashion, as opposed to a sudden release. It may be hard to imagine that an accumulation of those pretty little snowflakes can have enough force to do serious damage to property and person, but that is the reality. DualGard™ is a complete, 2-pipe snow retention system created for those who prefer a pipe-style snow retention system with the strength, testing, quality and time-proven integrity you expect from S-5!. DualGard can also be color-finished to match the roof. The system utilizes two anchor points per bracket, and can be engineered for structural adequacy online with our new DualGard Calculator and backed by independent lab testing. VersaGard™ is compatible with almost any trapezoidal, exposed‑fastened profile. No messy sealants to apply! No chance for leaks! VersaGard comes with factory‑applied butyl sealant already in the base, and the S-5!.‑patented reservoir conceals the sealant from UV exposure, preventing drying and cracks. X-Gard™ 1.0 is the newest snow retention solution from S-5!® and can be designed as a one- or two-pipe system spanning up to 48″. No other pipe snow retention system on the market has proven stronger than X-Gard. X-Gard™ is the newest snow retention solution from S-5!® and can be designed as a one- or two-pipe system spanning up to 48″. No other pipe snow retention system on the market has proven stronger than X-Gard. The innovative double-clamp design allows X-Gard to provide unprecedented holding strength when attached with S-5!’s standard clamps. S-5!® clamps are made from 6061-T6 aluminum extrusions conforming to ASTM B221 or aluminum castings conforming to ASTM B85 and to AA Aluminum Standards. The setscrews are made from 300 series stainless steel, 18-8 alloy. In order to promote the best non penetrating clamping system S-5! ® has performed hundreds of tensile-load tests to prove the holding strength of the clamps. All tests were performed by a third party A2LA accredited laboratory, all results are available online. The concept of combining photovoltaic arrays with standing seam metal roofing is growing—and for good reasons. A standing seam metal roof has a life expectancy consistent with that of framed PV modules. A 30-year power source on a 40-year roof, along with zero-penetration technology, creates the most sustainable roof system available with alternative power generation, all without compromising the roof manufacturer’s warranty! 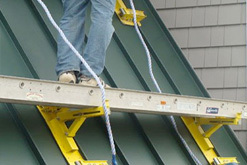 The world’s best standing seam metal roofing brackets—The Ultimate Bracket, The Big Boy’s, and The Roofer’s Helper—began with a metal roofing contractor who realized that his work time was inefficient. Provides 10mm (1/2″) continuous contact with flashed pipe providing a watertight seal. Tie Downs and Standoff’s are what the PowerGrip and PowerGrip PLUS were designed to replace. The PowerGrip and PowerGrip PLUS install in UNDER 10MINUTES!!! Normally a PowerGrip installs in 3-4 min max and the PLUS unit adds 2 minutes! Both install in under 10 minutes each and that’s with slow roofer. The PowerGrip PLUS is a structural mount, 1075lbs shear and over 2,000lbs of tensile loadings. OMG PipeGuard is designed to support rooftop steel pipe, electric conduit, and copper tubing off the roof surface. It is made from weather-resistant EPDM, which prevents damage to the roof system, while allowing for expansion. The unique, one-piece, triangular design is engineered to shed water while its wide platform base provides stability and balance. 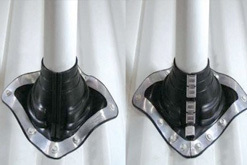 A properly installed PowerGrip PLUS provides a secure anchor to the roof deck and remains watertight. Available in most PVC and TPO membrane brands for 100% compatibility. Sky Products is proud to introduce a new product to its clients; Unistrut Walkways. Roof top walkway systems, work platforms, and crossover platforms designed and installed by Unistrut Service Company offer a low-cost solution to rooftop damage caused by foot traffic and the installation of heavy equipment. On membrane, built-up, foam and coated roofs, Unistrut roof top walkway systems and roof top work platforms protect against puncture, abrasion and wear along with providing a safe, clearly defined, anti-skid walking surface. Unistrut Roof Top Walkway Systems and Work Platforms WILL…. Which S-5! Standing Seam Clamp? www.s-5.com “Which S-5! 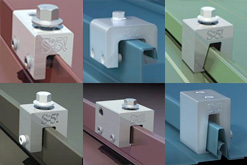 Standing Seam Clamp do I use on my metal roof?” Over the years we have received many questions about S-5! standing seam clamps and snow guards however that .. SNOW GUARD DESIGN WHY SO MANY QUESTIONS – Dave Kowch February 2019 Snow Guard design is dependent on a multitude of variables which need to be taken into consideration when designing and insta ..
S-5! Solar Attachments DID YOU KNOW Sky Products Ltd started out in the Solar Industry back in 2010 supplying thousands of non-penetrating S-5! Solar Attachments across Ontario. 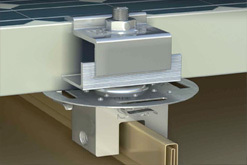 Over the years Sky Produc ..
Non-Penetrating Rooftop Mounting Word of the Week: What is Non-Penetrating Rooftop Mounting? Original by Kimberly Reichert on Feb 6, 2019 9:16:26 AM posted with permissions www.s-5.com Sky Products Ltd is the orig .. INTRODUCING THE POWER GRIP PLUS Tie Downs and Standoff’s are what the PowerGrip and PowerGrip PLUS were designed to replace. The PowerGrip and PowerGrip PLUS install in UNDER 10MINUTES!!! Normally a PowerGrip installs in 3-4 min max and the PLUS unit adds 2 minutes! Both install in under 10 minutes each and that’s with slow roofer. When retrofitting is required just cut and apply clips for ease of application. Clips included in purchase..